TMJ: Do I Need a Professionally Fitted Mouth Guard? 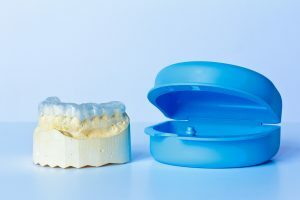 If you have been diagnosed with a temporomandibular joint disorder (TMJ), your dentist may have told you that a mouth guard, also called a splint, orthotic, or occlusal appliance may help ease your pain. These devices can be purchased over-the-counter and even online, but beware. Devices that are not personally and professional fitted are manufactured based on a fantasy theory that one-size-fits-all. In fact, each person’s mouth is different. A mouth guard, which is made of either soft or rigid acrylic material, fits over your own teeth. Since your bite, jaw size and placement, and other mouth features, are unique to you, the device needs to be professionally fitted to your own mouth. Keeping you from clenching your teeth together. Keeping you from grinding your teeth together. Holding your jaw in the correct position to correct an improper bite. Helping your jaw and facial muscles relax, which reduces muscle spasms, which reduces pain. Preventing your jaw from locking. Easing pain caused by a worn disc or arthritic condition. In order to accomplish the goal of relieving TMJ pain, an individual and precise fit is imperative. By having your dentist be the one to create this for you, he or she will be able to check it regularly and make any necessary modifications so that it provides you the relief that it is intended to provide. In fact, an improperly fitted device can cause more damage and result in increased pain due to aggravating the underlying cause of your pain. These are made to cover all of your teeth. They prevent clenching and grinding of your teeth (bruxism). Depending on your specific need, the guard will be made out of either a soft or hard material. They reduce pain by easing the overuse or extension of the jaw muscles. These reposition the lower jaw by pulling it forward. Initially, these are often worn 24-hours a day. After the pain subsides, a plan is made for long-term use of the device. For consultation and fitting of a professional mouth guard, contact Keith L Swartz, DMD. Find out if a mouth guard is the best choice for you and, if so, begin the professional fitting process.